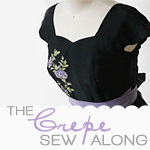 High on sewing success, I swung back into the Crepe Sew-Along project. Gertie has long since finished posting the sew-along steps on her blog, but that's the great thing about internet sew-alongs, you can technically join at any point and follow the posts. Today I cut out the muslin of the bodice, following the steps posted by Gertie here. It was just the right amount of sewing for me today. I found the instructions easy to follow. I noticed that Gertie uses tracing paper to transfer pattern markings to her muslin. I'd never thought about doing that. Make sense now that I see it. I didn't having any tracing paper so used the usual method (tailors tacks and eye-balling). Gertie's next step was to thread trace the seam allowance. This is another new thing for me. I've never thought about machine sewing as a way of marking the seam allowance and certainly hadn't considered whether a muslin needed stabilising. Then again, I've usually made my "muslins" out of calico, poplin, twill or other fairly sturdy cotton rather than actual muslin (the only stuff I've ever found is that ultra fine muslin for baby wraps or the crinkly cheesecloth stuff). Still, open to trying new things so by the end of today I had my bodice muslin pieces cut out, markings transferred and seam allowance thread marked. Just the right amount of sewing to fit the time I had between other activities. Thank you so much for commenting on my blog today. Your kind words of encouragement mean the world to me. I look forward to sharing vintage with you for years to come!